I know that I've mentioned before that I'm a real sweat-er. If I haven't. I am. I wish I had photoshop, I'd totally put myself right in between Barbarino and Horshack. Well, I've come across a bit of a frustration. When I'm running and when I'm teaching I have perspiration that falls into my eyes. Eeeeww. I. know. But it's truth and I'm putting it out there. 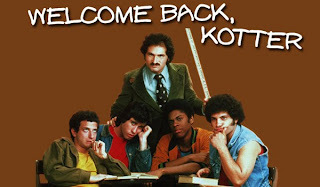 And, yes, I know Kotter originally aired in the '70s but I watched it first in re-runs in the '80s. Therefore it's '80s reference in my world.